Hannah trained as a primary school teacher at Sheffield Hallam University with a special interest in creativity in education and in her teaching life worked to enhance the curriculum through her role as whole school subject co-ordinator for Art and Design. 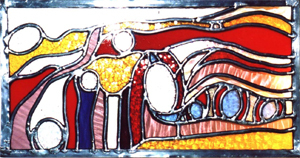 Hannah has also worked as a freelance artist specialising in designing and making contemporary stained glass panels, working to commission and also selling her work in craft shops and galleries around the country. It was after writing a scheme of work for Art and Design for an educational publishing company that Hannah made the decision to set up the Kids Arts Academy in Sheffield in 2008. Since establishing the Kids Arts Academy it has run every school holiday and also at the after school clubs during term time. Hannah has also delivered whole school art projects in different Primary schools in South Yorkshire and Derbyshire to create collaborative pieces of art to different themes. Hannah’s mum is a retired cookery teacher with 40 years’ experience and so Hannah was baking and cooking from an early age. Hannah is one of the Paediatric First Aiders and also the Kids Arts Academy Safeguarding Officer. Ellen is one of the key members of staff at the Kids Arts Academy; she has been part of the team since 2011 designing and delivering the art activities for both the regular art group and the Advanced art group. She has also delivered some of the Whole School Art workshops for the Kids Arts Academy in South Yorkshire and Derbyshire, resulting in some beautiful collaborative pieces of art work. Ellen has achieved A levels, a foundation diploma, followed by a BA (Hons) at Sheffield Hallam University ,all in Art and Design, having particular interests in drawing, printmaking and clay work. She has also been a gymnastics coach for over 6 years and also a voluntary member of St John’s Ambulance since the age of 6! Needless to say Ellen is one of our Paediatric First Aiders. Ellie Ragdale is a key member of staff at the Kids Arts Academy. She studied Drama and Film at the University of Manchester before returning back to Sheffield to join the Kids Arts Academy team. Whilst at University, Ellie discovered her passion for stop motion animation and began making her own short films, which have since been screened at festivals across the country and beyond. She has also worked on various music videos, short films and animations with acclaimed filmmakers, and has worked in the Art Department of the Cbeebies show Justin’s House . Ellie has recently set up her own immersive community cinema for children and families called Handmade Cinema (www.handmadecinema.co.uk). Here, she collaborates with Ellen (from KAA) to transform the screening venues into the film’s location, creating a new cinematic experience in which the audience can enter, and interact, with the world of the film.